Created by the American artist Robert Smithson in April 1970, the Spiral Jetty is located in a dynamic region of Great Salt Lake in northern Utah. Smithson's interest in the interplay between art and the natural environment has led to a work of art situated in a lake where the water level continually rises and falls. 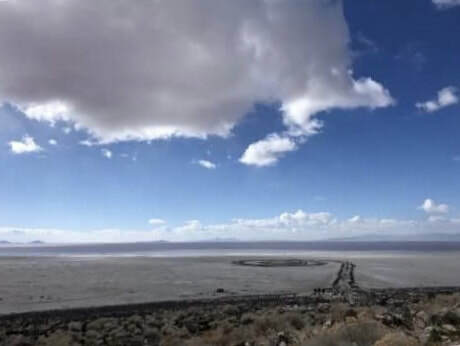 The Salt Lake Tribune created a video in 2013, Utah's Spiral Jetty, an artist's work on nature's canvas, which depicts the earthwork and its beautiful environment. This page provides images of the Spiral Jetty with corresponding lake levels: when created in 1970, Great Salt Lake's levels were 4195.15 feet above sea level. . For an overview of the Spiral Jetty and lake levels recorded each April from 1970-2010, see my article The Spiral Jetty: Strata of Water. For current lake levels in the northern half of Great Salt Lake, see data provided by USGS for Great Salt Lake water levels. 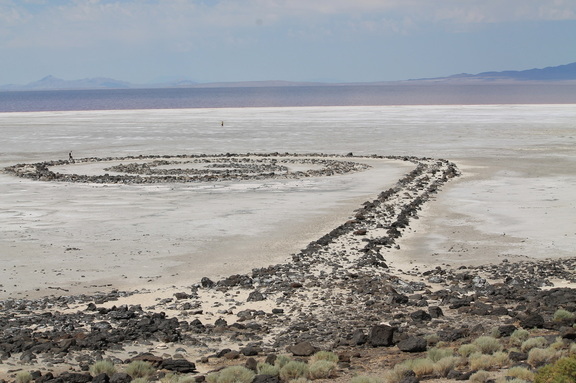 For more information on Smithson and the Spiral Jetty, see Dia Art Foundation and Robert Smithson at James Cohan Gallery. The Spiral Jetty, photographed by Brian Roberts on November 23, 2018. Lake levels declined from the summer to 4191.75 ft. The Spiral Jetty, photographed by Karly Anderson, on June 9, 2018. Lake levels remained steady at 4193.75 ft. The Spiral Jetty, photographed by Cheree Garn Nielson, on February 10, 2018. Lake levels remained steady at 4193.75 ft. The Spiral Jetty, photographed by Gilles Tiberghien, on December 4, 2017. Lake levels remained approximate to Octobers reading, at 4193.8 ft. The Spiral Jetty, photographed by Joel Long, on October 1, 2017. Lake levels dropped slightly since the summer, to 4193.20 ft. The Spiral Jetty, photographed by Patrick de Freitas, on June 21, 2017. Lake levels held relatively steady at 4194.40 feet during the month of June. The Spiral Jetty, photographed by Hikmet Sidney Loe, on June 3, 2017. Lake levels continue to rise due to increased precipitation, mountain runoff, and the creation of the Lucin Cutoff breach in early December, to 4194.50 feet. The Spiral Jetty, photographed by Elliot Mink, on May 3, 2017. Lake levels continue to rise due to increased precipitation and the creation of the Lucin Cutoff breach in early December, to 4194.20 feet. The Spiral Jetty, photographed by Hikmet Sidney Loe, on March 25, 2017. Lake levels continue to rise due to increased precipitation and the creation of the Lucin Cutoff breach in early December, to 4193.25 feet. Lake levels are expected to rise even more in the next few months. The Spiral Jetty, photographed by Hikmet Sidney Loe, on March 8, 2017. Lake levels have risen rapidly from the last report due to increased precipitation and the creation of the Lucin Cutoff breach in early December, to 4192.75 feet. Lake levels are expected to rise even more in the next few months. The Spiral Jetty, photographed by Hikmet Sidney Loe, on December 7, 2016. Lake levels that day had risen very slightly from the last report, to 4189.5 feet. The Spiral Jetty, photographed by Joel Long, on October 30, 2016. Lake levels that day dropped from last recorded on this site, to 4189.25 feet. The Spiral Jetty, photographed by Mark Ferne, on May 13, 2016. Lake levels that day were similar to last month, at 4190.75 feet. The Spiral Jetty, photographed by Sandy Jones Morgan, on April 12, 2016. Lake levels have continued to drop, recorded that day at 4190.75 feet. These historic low levels are cause for concern among many regional agencies. The Spiral Jetty, photographed by Joey Kernisky on June 17, 2015. Great Salt Lake levels continue to drop, recorded that day at 4192.3 feet. The Spiral Jetty, photographed on March 15, 2015 by Lauri Robinson. Lake levels that day were consistent at 4192.5 feet. The Spiral Jetty, photographed on September 14, 2014, by Tom Martinelli. Lake levels re﻿mained consistent at 4192.75 feet on this day. According to a recent article in The Washington Post ("Great Salt Lake approaches 167 year record low" 8/19), "Utah’s Great Salt Lake, which is the largest salt water lake in the western hemisphere, has been on a gradual decline over the past few years, and is now about two and a half feet away from its record low level of 4,191.35 feet. In 2014 alone, the lake has been losing around half a foot per month since May." The Spiral Jetty, photographed on September 9, 2014, by Robert Hatch. Lake levels continue to recede, reaching historic lows. Lake levels remained consistent at 4193.00 feet on this day. The Spiral Jetty, photographed on June 27, 2014, by Robert Mizaki. Lake levels hovered around 4193.8 on this day, as the waters continue to recede from the shoreline. The Spiral Jetty, photography by Joey Kernisky, on June 17, 2014. Lake levels hovered around 4194.00 ft. on this day. The Spiral Jetty, photographed on May 15, 2014 by Hikmet Loe. Lake levels were consistent at 4194.3 ft on this day. The Spiral Jetty, photographed by Wendy Wischer, on February 25, 2014. Lake levels were consistent at 4194.00 ft on this day. The Spiral Jetty, photographed by Gabriella Hunter, on January 26, 2014. Lake levels were consistent at 4194.00 ft on this day. The Spiral Jetty, photographed by Hikmet Sidney Loe, on November 20, 2013. Lake levels averaged 4194.00 ft on this day. The Spiral Jetty, photographed by Lee Asahina on August 24, 2013. Lake levels averaged 4194.5 on this day. Photograph of the Spiral Jetty, taken by Lewis Crawford on July 24, 2013. Lake levels for that day were 4195.25. The Spiral Jetty, photographed May 25, 2013, by Hikmet Sidney Loe. Lake levels were 4196.0 for the day. The Spiral Jetty, photographed on May 6, 2013, by Jessica Van Leeuwen. Lake level for the day averaged 4196.25 ft. The Spiral Jetty, photographed on April 14, 2013, by Brian Staker. Lake level for the day averaged 4196.25 ft., a slight increase from last fall. The Spiral Jetty, photographed on November 25, 2012, by Daniel Shank Cruz. Lake level for the day was 4195.5, approximately the same level as the previous month. The Spiral Jetty, photographed on October 19, 2012 (both photographs by Hikmet Sidney Loe). Lake level for the day was 4195.4. 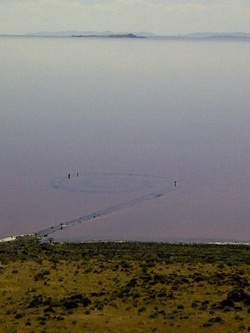 It is almost possible to walk the entire Spiral Jetty without getting wet! The Spiral Jetty, both photographs taken by Hikmet Sidney Loe, on September 22, 2012. Lake level that day averaged 4195.7 feet. The lake continues its slow decline. The Spiral Jetty, both photographs by Joe Kraft, taken on August 31, 2012. Lake level that day was 4196.0. 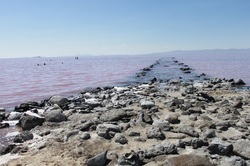 Photograph of the Spiral Jetty, taken July 14, 2012. Water level for the day was 4196.9. Photograph by Joy Garnett. 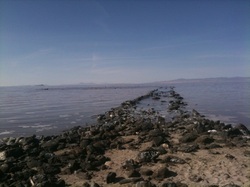 Photograph of the Spiral Jetty, taken May 21, 2012. Water level for the day remained at 4197.6 ft. Photograph by Jaimi Karoline Butler. Photograph of the Spiral Jetty from March 19, 2012. Elevation for the day was 4198.1, over two and a half feet above the lake level at which the Spiral Jetty was built in April 1970 (4195.4 ft.). The Spiral Jetty is fully submerged for the first time in a few years. Photograph by Hikmet Sidney Loe. Photograph of the Spiral Jetty from January 15, 2012. Elevation for the day was 4197.2. Photograph by Russell E. Costa/Hikmet Sidney Loe. Photograph of the Spiral Jetty from January 15, 2012. Lake elevation for the day was 4197.2. Photograph by Russell E. Costa/Hikmet Sidney Loe. 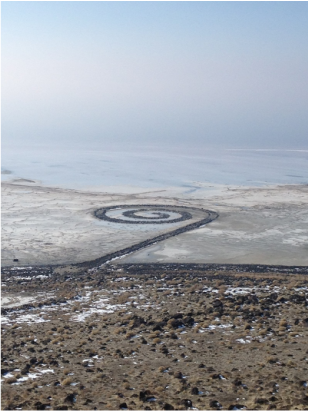 Photograph of the Spiral Jetty from December 27, 2011. Lake elevation for the day was 4197. The lake has risen slightly since the fall months. Photograph by Mehmet Dogu. Photograph of the Spiral Jetty from October 27, 2011. Lake elevation was 4196.7 that day. Photograph by Jaimi Karoline Butler. Photograph of the Spiral Jetty from October 8, 2011. Lake elevation was 4196.8 that day. Photograph by Hikmet Sidney Loe. Photographs of the Spiral Jetty from October 1, 2011. While the lake level has receded slightly, the water level is still high. Lake elevation averaged 4196.8 for the day. Photography by Hikmet Sidney Loe. 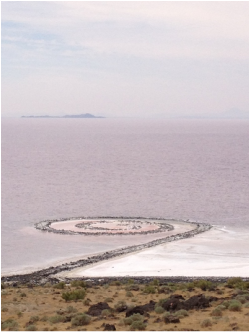 Photograph of the Spiral Jetty from August 11, 2011. The small images in the water on the left are not rocks, they are the heads of people swimming at the Jetty. Right behind them are people standing in the water. Photograph by Jaimi Karoline Butler. Lake elevation averaged 4197.3 ft. for the day. 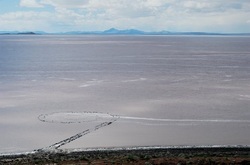 Photograph of the Spiral Jetty taken August 7, 2011, by Nicholas Serota. Lake elevation averaged 4197.4 ft. for the day. 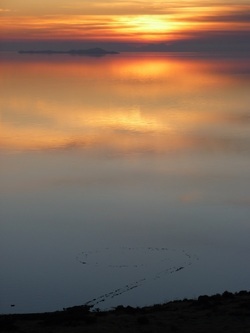 Two photographs of the Spiral Jetty taken by Michael Slade, July 30, 2011. Michael waded through water 2-3 feet of water, beyond the Jetty, to take these photograph. Lake elevation averaged 4197.2 ft. for the day. 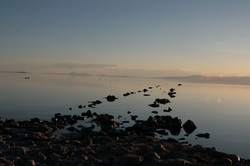 Two photographs of the Spiral Jetty taken by John Cinosky, while accompanying Alicia Cuccolo on her "American Land Art Tour 2011." They were at the site on July 27, 2011, when the lake elevation averaged 4197.2 ft. for the day. 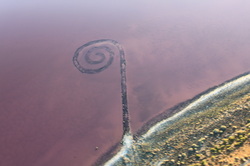 Aerial photograph of the Spiral Jetty, taken July 15, 2011. Photograph by Cindy Lund. Lake elevation averaged 4197.1 ft. for the day. 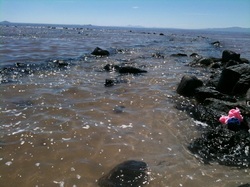 The Spiral Jetty from the shoreline, taken July 15, 2011. Photograph by Fabien Danesi. Lake elevation averaged 4197.1 ft. for the day. 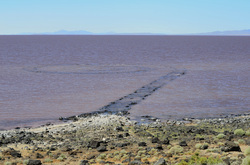 The Spiral Jetty from the outer coil, taken June 15, 2011. Photograph by Jaimi Karoline Butler. Lake elevation averaged 4197 ft. for the day. The Spiral Jetty from the hilltop, taken on June 7, 2011. Photograph by Ray Boren. Lake elevation averaged over 4196.5 ft. for the day. This image is from June 5, 2011. USGS lake level averaged 4196.5 ft. for the day. The Spiral Jetty is almost submerged. Photograph by Jaimi Karoline Butler. This image is from June 1, 2011. USGS lake level averaged 4196.2 ft. for the day. The Spiral Jetty is on its way to being submerged. Photograph by Jaimi Karoline Butler. This image is from April 22, 2011. USGS lake level averaged 4195.5 ft. The Spiral Jetty is dry. Photograph by Hikmet Sidney Loe.